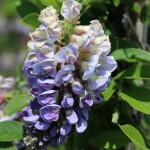 A compact vine with bright green foliage and lavender-blue flowers on 4"- 6" racemes in spring that repeat all summer. Blooms at an earlier age and is less vigorous than Asian varieties. It does best in full sun to part shade in an moist, well-drained soil. Grow over trellis, arbors, or trees. The species is native to the southeastern U.S.